When we practise Qigong, Taijiquan and other styles of Kung Fu there is Zhan Zhuang practice. “Zhan 站”means “Standing” and “Zhuang 椿”means “Pole”. Standing like a Pole, this is Zhan Zhuang. The purpose of Zhan Zhuang is to build up our Qi. When we stand so the Qi is stored in the marrow in our bones. If our Qi is strong then we will be healthy, if our Qi is weak, then we will be weak, it is as simple as that. In order to build up our Qi we need to train our bones and standing is one of the best ways as it allows us to develop our Qi, develop our bones, develop our power and also develop our minds. 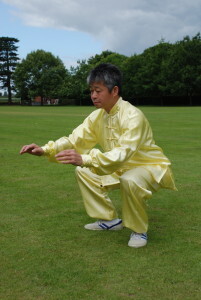 When training Zhan Zhuang, we should begin with a high position and then eventually go to a low position. We should start with a short time at first, 5 minutes to 10 minutes and then build up to half an hour, an hour or even 2 hours. The feeling it gives you is hard to describe. You feel good, strong and full of energy. We just need to relax and empty our minds and a let everything happen naturally.